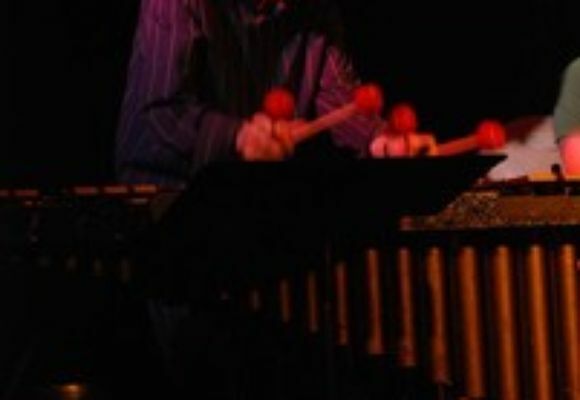 Vibraphonist and composer Michael Pinto brings a fresh and dynamic voice to the music world. Combining virtuosic skill and an untethered sense of adventure, Michael provides both innovation and tradition to his ensembles and those of which he is a guest. Michael grew up in Medford, New Jersey, where he began studying music in the fourth grade. He discovered his love of jazz during his sophomore year of high school, when he became obsessed with a cd of Vibraphonist Milt Jackson with the Modern Jazz Quartet. Around that time, Michael began his diligent studies to master the arts of music and jazz. Within one year, Michael was winning numerous awards at every jazz festival he attended. He chose to continue his studies with a scholarship to Berklee College of Music in Boston. At Berklee, Michael earned a degree in Music Education. His training provided him with a vast amount of experience in the teaching world, including private lessons, high school teaching, and grade school teaching. Being careful not to neglect his musical skills, Michael studied jazz and vibraphone with vibraphonist Dave Samuels and traveled regularly to New York City to study with Stefon Harris and Jason Moran. After his time at Berklee, Michael decided to pursue his jazz career in NYC, where he is surrounded by a vast number of the world's greatest musicians. Since coming to New York, Michael has been performing as a leader and sideman in world class jazz venues such as the Village Vanguard, Birdland, Jazz At Lincoln Center's Dizzy's Club Coca Cola, Smalls, Sweet Rhythm, Fat Cat, Chris' Jazz Café (Philadelphia), and more. Recently, Michael has become an active member of the Greg Osby Five, which has taken him from Perugia, Italy, to the Village Vanguard in New York City. Michael has also performed with such musicians as Nasheet Waits, Logan Richardson, Greg Osby, Billy Hart, Eric McPherson, Tommy Crane, Sara Serpa.